The story Friday night, in a nutshell, was simple: The Bulldogs could not stop Goddard quarterback Dalton Bowles for the majority of the game. 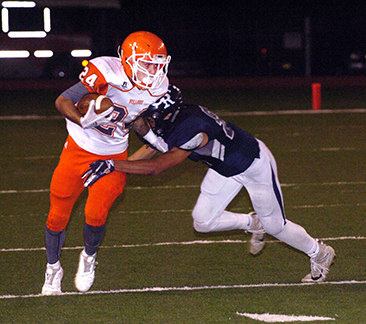 When taken in context with everything else, Artesia didn’t put forth a poor effort Friday in their second District 4-AAAAA bout at Wool Bowl. The offense performed well overall, and the boys in orange certainly had their chances – particularly in the fourth quarter – to put the contest away. But at brief moments, and unfortunately, when it counted most, things didn’t go the Bulldogs’ way. “I felt like we competed well,” head coach Rex Henderson said Saturday. “I was really proud of our kids for battling to the end. They competed in a lot of facets. 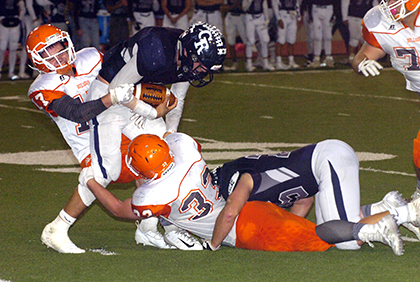 After chasing Bowles all over the turf for the better part of 36 minutes, the Bulldog defense was finally able to slow the Rocket QB down as the fourth quarter began, and the result was a turnover on downs that – with the game tied at 28-all – gave Artesia the chance they’d been looking for to get a leg up. Unfortunately, the ‘Dogs’ ensuing drive would be of the three-and-out variety. 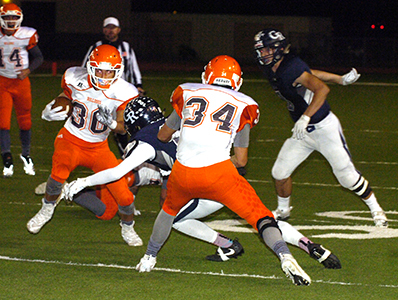 Again, however, the defense stepped up, forcing another turnover on downs in nearly the exact same spot 20 yards into Artesia territory, but after driving quickly to the Rocket 38-yard line, an ineligible receiver penalty pushed the Bulldogs back to the 43, and an interception on the next play gave Goddard the ball and the momentum. Bowles proceeded to run out all but the final five seconds of the contest, darting around from the Goddard 15 to the Artesia two, and from there, the Rockets were able to send a 19-yard field goal through the uprights to essentially seal the 31-28 win. The Bulldog coaching staff was loudly and visibly calling for a time out prior to the kick, but their efforts went ignored by the officiating crew. It was another frustrating end to a stressful night at Wool Bowl. “Those are all just the little things we’ve talked about throughout the season,” Henderson said. “I thought we’d reached a point of better consistency offensively, but then it kind of came back to haunt us again in the fourth quarter. 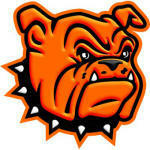 When the game commenced Friday, it looked as though the Bulldogs might be on their way to a romp. Artesia marched efficiently from their own 42 to the Goddard 18 on six plays, then stormed the end zone on the seventh, an 18-yard pass from senior quarterback Trent Taylor to JR Bustamante with 9:05 to go in the quarter. The defense followed that up with a pick of Bowles, courtesy of Ty Johnson. But the offense was bogged down near midfield on their next drive, forcing a punt, and the Rockets tied it up with 1:06 to go in the first on a 42-yard run by Bowles. That was a sign of things to come. After Artesia punted away their first series of the second quarter, as well, Goddard took the lead, 14-7, on a drive that almost exclusively featured Bowles, who punched it in from the one with 7:08 to go in the half. The ‘Dogs, meanwhile, were able to knot things up prior to the break despite losing Taylor to injury as the second quarter began. 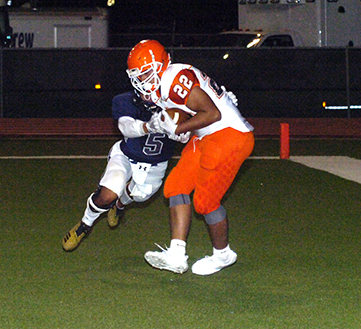 With junior Clay Houghtaling thrust back under center, Artesia scored on a five-yard pass from Houghtaling to Josue Fierro, and the boys in orange were able to generate a little more excitement prior to the horn on an interception and rumbling return to the Rocket 27 by Canon Carter. That gave the Bulldogs a chance to go up by two touchdowns, but the clock wasn’t on their side. Goddard, meanwhile, would take the field for the second half with a new game plan that consisted of “there goes Bowles,” and it resulted in a 20-yard touchdown by the QB as the third quarter began. A missed PAT by the Rockets gave the ‘Dogs the chance to claim the edge, and they did in their subsequent series, scoring on a 14-yard pass on fourth and 11 from Houghtaling to Alex Fernandez. But their 21-20 advantage didn’t last long, as Bowles let someone else – namely Sammy Zaragoza – have a turn for an 11-yard score with 2:42 to go in the third but then took back over for the successful conversion run. The ‘Dogs were able to tie things up one last time just prior to the fourth on a 30-yard pass from Houghtaling to Bustamante but could not take advantage of the breaks in the fourth. “We had our chances for sure in both the first and second halves,” Henderson said. “We were in scoring position twice in the first half and didn’t get points, and then, of course, there was the fourth. Houghtaling finished 14 of 23 for 153 yards, three touchdowns and a pick on the night, while Taylor was eight of 11 for 86 and a score prior to his exit. Bustamante led the receiving corps with eight catches for 123 yards, and running back Jagger Donaghe was 11-78 on the night. Bowles, meanwhile, finished with 408 yards on 47 carries. “We’re just going to continue now to work on the things that are going to make us a better football team down the road,” said Henderson. “We’re in a position where we’ll be in the playoffs. We’ve lost control of where, but we’re going to be in it. Now 1-1 in district play, the Bulldogs will close out their 2018 regular season next week on the road, heading to Alamogordo to take on the 1-8 Tigers. Alamo fell to Roswell Friday by a final of 56-21. In terms of how Artesia will finish up in the district, it will take a Goddard win over Roswell or a Coyote win by more than five points to place them in second.